Troop 31 Scoutmaster, Ray Coe, awards Eagle recipient, Walip Yenbutr, with the highest rank in Boy Scouts, Eagle Scout during a ceremony, earlier this month. PENNSBURY — Walip Yenbutr was awarded the rank of Eagle Scout during Troop 31’s award ceremony, at Hillendale Elementary School, Dec. 16. Attaining the rank of Eagle caps Yenbutr’s scouting career, which started in third grade when he joined Pack 131. He received the Arrow of Light in 2006 when he crossed over from Cub Scouts to Boy Scouts in Troop 31. 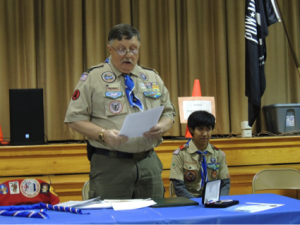 During his seven years with Troop 31 he learned a lot of essential life skills and was a Senior Patrol Leader, Assistant Senior Patrol Leader and a Patrol Leader. He is now a Computer Engineering student at the University of Delaware. 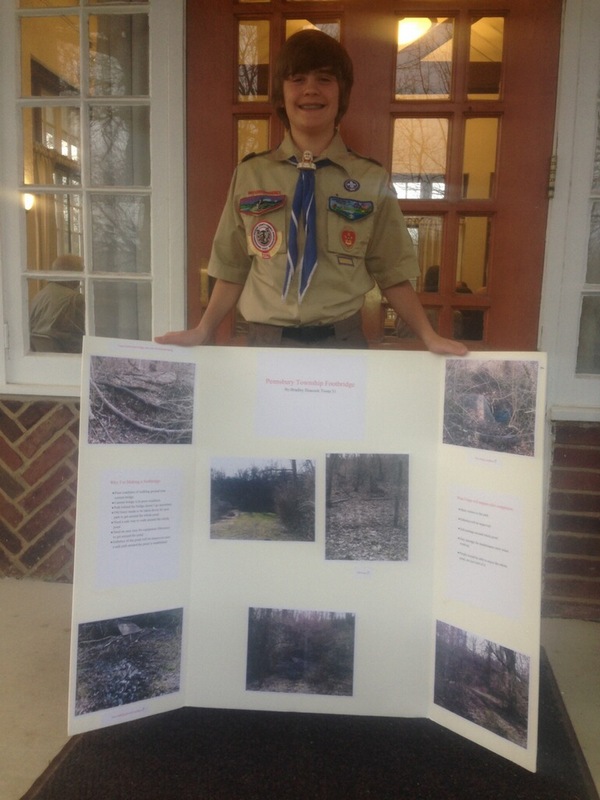 He finished his Eagle project this past summer. He planned and carried out the installation of two small sections of fencing, a 24-foot gate, and some landscaping for the Hillendale Elementary School to ensure safety for the children while they’re on the playground area during recess. Yenbutr gave his Mentor Pins to his Eagle Coach, Mark Dulik, and Scoutmaster, Ray Coe. He is the one hundred and twenty third Eagle Scout in Troop 31 history and sixty-sixth under the current Scoutmaster, Ray Coe. Preceding the Eagle ceremony was the troop award ceremony when 22 rank advancements and 87 merit badges were awarded. Also, Brandon and Bradley Heacock earned two religious awards. The evening’s program also included a Wood Badge ceremony, which is awarded to an adult who takes a six day leadership course and then performs various leadership programs for scouting. This prestigious award is one of the highest awards an adult can earn and is often viewed as an Eagle for adults. The Wood badge recipient was Andrew Coe, son of Scoutmaster, Ray Coe. Prior Wood Badge recipients Meric Vitale and Mark Dulik assisted Wood Badger Ray Coe, in presenting the award to Andrew. Andrew, an Assistant Scoutmaster with Troop 31, is also the Lodge Adviser for the Octoraro Lodge 22 of the Order of the Arrow in Chester County.